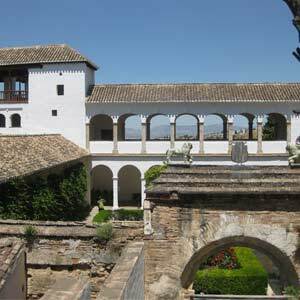 - Visit the Alhambra of Granada in a private tour, skip the line without delays! 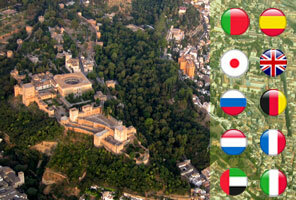 - Total exclusivity: Do not worry about how to buy Alhambra tickets or look for a private guide. - All the comfort's at your reach to transform your private visit into an unforgettable experience. Visit Granada and enjoy with our private Alhambra tour of Granada, declared Patrimony of Humanity by UNESCO and one of the most visited monuments in the world. Go into the world of the “One Thousand and One Nights” and be dazzled by the beauty of the Nasrid Palaces, the magic of its gardens and the contemplation of an historic city from infinite viewpoints. The Nasrid Palaces, where you can find the famous Courtyard of the Lions, the defensive zone of the Alcazaba, the majestic Gardens of the Generalife and the Palace of Carlos V.
(1) The exclusive accompaniment, throughout the morning, of an official guide who will guide you around the entire monument. (2) The purchase of Alhambra tickets, which our guide will give you at the time and meeting point indicated before. You won’t have to wait, skip the line! Time and meeting point: The meeting point will always be at the Granavision Welcome Visitor Centre, next to the Alhambra (just 100 meters from the Car Park N1). The schedule for the afternoon tour varies depending on the day, may be between 1:00pm and 5:00pm, so to confirm the exact time, please call the day before the tour, between 11:00am and 1:00pm hours or between 5:00pm and 7:00pm, to the following number: 958 535 872. Our Reception Centre is open from 8:30am, so we recommend you go early in the morning, so you can find out information about tourism offers in the city, enjoy our reading spot and free Wi-Fi area or have breakfast in the cafe while the children have fun in the playground. Our greatest wish is that your day in Granada starts in the best way possible. Return point: The private tour will end at the same point of the meeting. - If you want to be picked up at your hotel or at any other place, whether in Granada or another city, please request a budget to reservas@granavision.com or also by phone (+34) 958 535 872. - Due to the length of the visit we recommend you to wear comfortable shoes. - Occasionally the itineraries may be modified by indication of the Patronato. - If you want to modify or cancel your booking, please contact us through the contact form or on the phone above indicated. Once you have completed your booking you will receive the confirmation and voucher in your email which also will include the time and meeting point with our guide. This voucher must be printed and showed to your guide before the beginning of the private tour to receive your tickets for the monument. This voucher is your proof of purchase and we won’t admit any other type of proof to do the activity. If you request transport, you must call us one day in advance of your visit to reconfirm it, between 11am and 1pm to one of our phones(+34) 682 086 011 - (+34) 958 535 872.